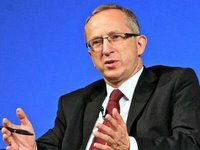 The European Union plans to launch new funding programs for Ukraine, but a lot of money could remain unused due to a lack of relevant Ukrainian projects, Head of the EU Delegation to Ukraine Jan Tombinski has said. "Ukraine is a country that has been stalling in the lowest category over the past 25 years. Therefore we need a strategy so that it could join a higher category. And self-governance is one of the elements of such a strategy. We can see the example of the countries in which self-governance was introduced in the post-Soviet era and what the result is. And these results should be achieved in all the cities of Ukraine," Tombinski said at the fourth Local Self-Government Forum organized by City Institute in Lviv. According to the official, Ukraine should make decisions that will present people locally, as responsibility at the local level is much higher than at the central one. Tombinski stated we need to study the experience of other countries and use the "unique international assistance" Ukraine had been provided in the past two years. "But everything depends on Ukrainians – how this assistance will be used. We cannot help someone who does not work or works improperly," he stressed. Tombinski noted the country needed elements that could be implemented at the local level. To this end, it is necessary to create a committee to study experience, seek successful projects in Ukraine and distribute them to a lower level.